We'll have a meet and greet at Legacy motors then we'll "Cruise the Boulevard" down to 4700 SW Topeka Blvd - Boulevard Billiards Sports Bar and Grill for some fantastic food and beverages. Got a cool ride? Bring it! You can send payment for your tickets through Venmo to: TWHS Reunion. Download the app and follow instructions. 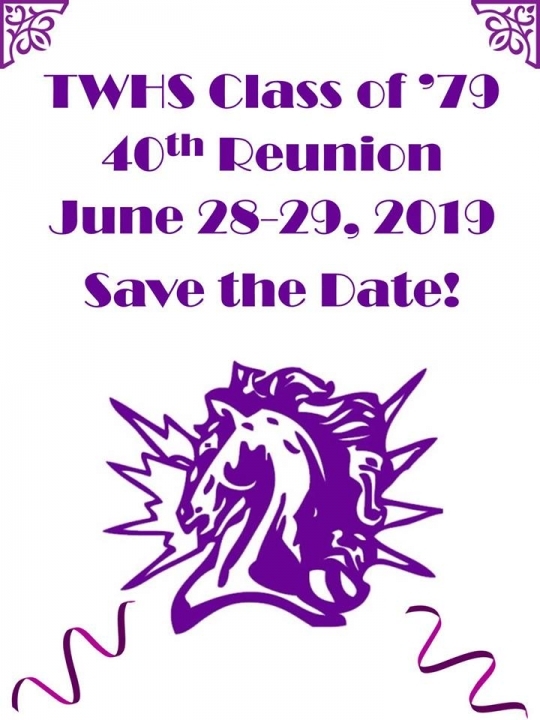 Join our Class Alumni Facebook https://www.facebook.com/groups/TWHS1979/ to keep up on the latest details and with fellow classmates. We have a block of $99 rooms for anyone coming in from out of town. Our Saturday main event will be held at the hotel in a ballroom with a buffet dinner. More to come. Prices of our tickets will go up as the event date gets closer! AlumniClass.com (3242) - 10019 E Knox Ave, Spokane Valley WA, 99206.